Wish you could gauge equity market sentiments before investing in stocks? Though predicting equity markets and stock movements are not easy, equity analysts use many methods and indicators to predict market movements. These indicators are both fundamental (price-to-earning, or P/E, ratio, price-to-book value, or P/B, ratio, interest rates) and technical (put-call ratio, volumes traded). EXPERT TIP:What to do with shares with no buyers? While indicators such as P/E and P/B ratios are often quoted, we will discuss some indicators that are widely used by traders and fund managers to predict market movements but are not known to many retail investors. 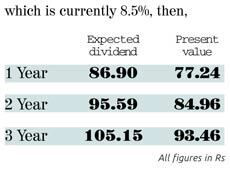 Dividend yield is calculated by dividing the annual dividend paid on each share by its current price. For example, if a stock paid an annual dividend of Rs 22 and the current market price is Rs 440, the dividend yield of the stock is 5 per cent. So, what does dividend yield tell about the future price of a stock? A high dividend yield, on the other hand, means subdued interest in the stock and that the company is trying to woo investors by paying higher dividends. It means the stock price is undervalued. This can be extended to a stock index too. One can calculate the aggregate dividend yield of an index, compare it with past dividend yields and see if the current yield is low or high. A low dividend yield indicates an overpriced market and vice versa. Let's demonstrate it by a simple calculation. According to the National Stock Exchange data, the average dividend yield of the Nifty in the last couple of months has been around 1.5 per cent. On 2 November 2011, the Nifty closed at 5,263. The current dividend yield is Rs 79. Hence, at its present value (5,263), the Nifty is overvalued and may fall in the immediate future. Though the name smells of something unlawful, not all insider trades are illegal. According to Indian laws, an insider is a top official, director or shareholder who owns 10 per cent or more shares and has access to unpublished price-sensitive information about the company. A member of the board, merchant banker, share transfer agent, debenture trustee, broker, portfolio manager, investment advisor, sub-broker or even a relative of any such individuals is also an insider. "The corporate sector is a net borrower and an increase in interest rates is usually negative for it. Higher rates also hit demand in rate-sensitive sectors." Insider trading based on unpublished price-sensitive information is illegal. An 'insider' can buy or sell shares provided they inform the stock exchanges on which the stock is listed if the transaction goes beyond a certain threshold. If the shareholding of an insider changes by more than Rs 5 lakh in value, 25,000 shares or 1 per cent of total shares or voting rights, it has to be brought to the notice of stock exchanges and the company. Information on insider trading is available on websites of stock exchanges and can be used to predict future prices. Here's how. Studies suggest that while an insider may have many reasons to sell, the only reason for buying can be that he is bullish on the prospects of the company. Changes in interest rates impact companies. Conventional wisdom says one must buy shares when short-term rates (treasury bills) are low and sell when they are high. Rajeev Thakkar, CEO, Parag Parikh Financial Advisory Services, says: "The corporate sector is a net borrower of funds and an increase in interest rates is usually negative for it. Higher rates also hit demand in rate-sensitive sectors such as real estate and automobiles." "A high put-call ratio indicates an over-cautious stance by market participants and hence there is less chance of the equity market falling further." Usually, short-term rates (treasury bills) are lower than long-term rates (10-year government bonds) as the latter factors in uncertainty in the long term. However, when rates on short-term securities are higher than that on long-term ones, it hints at a possible recession. At present, the two rates are close-on 2 November 2011, the 10-year government bond and three-month treasury bills were around 8.7 per cent. Trading volume indicates the number of shares or contracts traded in the market. It tells if a particular price trend is supported by market players. If the price of a share is increasing with higher than normal volume, it indicates investors support the rally and that the stock would continue to move upwards. However, a falling price trend with big volume signals a likely downward trend. A high trading volume can also indicate a reversal of trend. For example, a drop in the share price with very high trading volume is viewed as a sign that the stock has hit the bottom. A put option is an agreement between two parties to exchange an asset at a pre-determined rate on or before a specific date. The buyer of the put option has the right but no obligation to sell the asset (stock, commodity) at a specified price on or before a fixed date, while the seller has the obligation to buy at the pre-specified price if the buyer wishes to exercise the option. A call option, on the other hand, gives the buyer of the option the right but no obligation to buy a particular asset from the seller of the call option at a fixed price on or before a particular date. The put-call ratio is calculated by dividing the number of traded put options by the number of traded call options. If the put-call ratio is increasing, it means the number of traded put options is increasing, signaling that either investors fear the market will fall or are hedging their portfolios foreseeing a decline. Sahaj Agrawal, associate vice-president, derivatives, Kotak Securities, says, "A high ratio indicates an over-cautious stance by market participants and hence chances of the market falling are low. Contrary to that, a low ratio indicates over-optimism, and hence caution should be exercised." Though these indicators are frequently used by traders and fund managers to predict market movements, they may lead to wrong results if used separately, as they are not fool-proof. You can use these together to arrive at a more credible conclusion.